An experiential learning program to help you understand and manage your relationship patterns. Tools for managing challenging aspects of relationships and difficult transitions will be presented and practiced. This psycho-educational workshop is for healthy individuals and couples who are interested in self-discovery. Part II on the second day of this workshop will provide participants opportunities for individual personal work in a group setting. Part II is optional. For current workshop dates and details see www.winningtogether.org or contact Felipe Garcia at fgarcia99@gmail.com. With Pamela Levin, R.N., C.T.M. 10 one-hour streaming audio classes you can take without traveling anywhere. Discover how to thrive in the emotional landscape of life. The emotional tasks you need to carry out to thrive? The unique rules that govern how your emotional brain operates and how to work with each part of it? Which patterns of relating are emotionally nourishing and sustaining and which are toxic? Which aspects of your adult emotional life need to be the same as those of your childhood and which different? That you have an “emotional DNA” code, and how it instructs your emotional life? Which parts of your emotional life are due to “nature”, and which need “nurture”? How to recognize when you need to relate in a “joining with” way and when you need to create boundaries? Learn the answers to these and many other questions. Learn how to decode emotional signals – your own and others’ – that help you succeed in all aspects of your life. Pamela Levin is a nurse counselor and award-winning author who has researched and written about the path of emotional development in life for nearly 40 years. She studied with Eric Berne starting in 1966 and became the first nurse and first woman to be awarded Clinical Membership, then Teaching Membership. She has taught this material to both lay and professional audiences all over the world. Members of the International Transactional Analysis Association from 72 countries around the world voted that she receive the prestigious Eric Berne Award for this work. This Article by Felipe Garcia is from ITAA’s The Script Newsletter, Vol 36, No. 8, November 2006, “After He Said Hello” series edited by Pam Levin. I never met Eric Berne personally. I learned about transactional analysis from his writings and followers, from stories about him and the San Francisco seminars, from the culture of support and encouragement for continued development of TA that he fostered through the seminar, from his encouraging professionals to write and publish their ideas, and from my training sessions and ITAA conferences. As with transactional analysts all over the world, I greatly appreciate Berne’s brilliant, easy-to-understand explanation of complicated concepts and behaviors as seen though the lens of ego states, transactions, strokes, games, and scripts. Each of these concepts revolutionized the way I view myself and my relationships, whether in my personal life or with my clients in clinical, educational, and organizational settings. As a result of discovering ego states, Berne, his colleagues, and later TA theoreticians and practitioners defined the path to understanding and clarifying the significant difference between facts, opinions, feelings, and fantasies. This led me to learn and to teach others how to think using Adult facts and reality testing, taking feelings and intuition into account, and including moral judgments in making decisions, initiating transactions, and responding to stimuli from others and the environment. Understanding the difference between Adult facts; Child feelings, wants, and intuition; and Parent values, morals, limits, and “ways of doing things,” I also learned to think about my feelings in order to take better care of myself and to let others know how their behavior impacts me. Before learning to think using all of my ego states, for example, when I felt hurt or offended by someone else’s behavior, I would pout, avoid, withdraw, and “feel bad.” I would either reenforce my beliefs that others were not to be trusted or that there was something wrong with me. I use my Nurturing Parent to support my hurt Child. I check with my Parent and Adult about options for responding. I take time to think before acting automatically. I learned from Eric that I have options in behaving and responding for an optimal outcome. This helps me avoid games and advancing either an “I’m not OK” or “He is not OK” existential position. I also learned to use my Adult ego state to evaluate and update my moral judgments, racial and sexist biases, and the Parental styles I learned from my parents and my cultural surroundings. Instead of believing that the way we do things in my family or in the United States or as Christians is always the right, moral, and best way, I allowed myself to notice and learn how other cultures and people from different backgrounds and circumstances do things and live their lives. I learned that there are many viable ways to act and live. My Adult and Little Professor also provide me with opportunities to think about and reevaluate early survival decisions I made during different stages of my development. Thus I have the chance to make new decisions about how to take care of myself while taking others and the reality of the present situation into account. I was the youngest of five siblings, and my role in our family was to be cute and charming. Even though I was stroked for being smart, with so many older, “more experienced” people in my house, I decided that my opinions were not as valuable as others’ and that I needed to depend on others to do things for me. After transactional analysis therapy, decontaminating my Parent-Child contamination, and making new decisions, I am much more comfortable voicing my opinions and dong things on my own. Transactional analysis proper led the way for me to consider options when initiating requests, resentments, interpretations, and strokes as well as when responding to stimuli from others. Berne invited me to learn to be autonomous, choosing where to put my psychic energy in order to be most productive and successful. As Berne (1966) wrote, “The transactional patient learns to control his[/her] free energy to a considerable extent, so that he[/she] can shift his[/her] ‘real Self’ from one ego state to another by an act of will” (p. 307). I also learned from Berne (1961, pp. 31-35) that because of childhood circumstances and experiences, some people have great difficulty “shifting their real Self from one ego state to another by an act of will” because of ego state exclusions, contaminations, lesions, and ridged boundaries. These boundary issues must be addressed therapeutically for shifting energy to be possible. Berne emphasized that with few exceptions, people have the capacity to use their Adult even while the therapy is taking place. This makes contracting with clients possible and allows them to be cotherapists on their own behalf. With regard to contracting, I have always appreciated Berne’s emphasis on mutual respect between therapist or consultant and client. This reminds me that it is clients who have the power to heal and take charge of their lives by understanding ego state dynamics and other transactional analysis concepts. To deconfuse the Child ego state of the remaining effects of early developmental issues, Berne recommended deeper therapy in order to reach the goals of transactional analysis: spontaneity, autonomy, and intimacy. The permission and support begun by Eric and fostered by the members of the organization he founded has encouraged me and many others around the world to continue to develop the theory. My particular areas of further development have focused on transactional analysis proper and exploring communication options to minimize games and passivity. I have also found one of the basic assumptions of transactional analysis-“I’m OK, You’re OK, They’re OK”-to be a springboard for exploring theories and methods for building coalitions, winning together, and avoiding violence and war. I am presently thinking about Berne’s concept of bound, unbound, and free cathexis. This theory has great potential for helping us learn to manage and take charge of the psychic energy that energizes ego states. While being aware of feelings and learning to respond to them effectively is central to maintaining autonomy, sometimes feelings and Parent reactions to stimuli are not useful. When my judgments and feelings are not necessary in the present situation, I find that “decathecting” psychic energy and shifting from free and unbound to bound energy is helpful. This allows me to center myself and either be an observer or to rest, relax, and meditate. I find that “uncathecting” my ego states is a worthwhile goal. This allows me to void myself of opinions, feelings, facts, and actions as much as is possible so as to observe others and the environment or to meditate by clearing my mind of all thoughts and focusing only on my breath. There is an abundance of what I learned from Eric Berne though his writings, the teachings of his students and colleagues, current theoreticians, and my own intuition, curiosity, and research. I have been excited and “hooked” on transactional analysis since 1973 when I first read I’m OK-You’re OK by Thomas and Amy Harris and What Do You Say After You Say Hello? by Berne. I have attended all but two international transactional analysis conferences in the last 33 years and have stayed active in the ITAA and the USA TA Association. I continue to learn and explore deeper levels of applications of the theory in social interactions, personality development, and organizational and group applications. 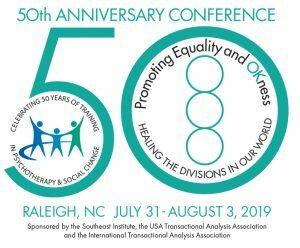 I am proud, honored, and joyous to be part of the international community of transactional analysts and greatly appreciate the opportunities to connect and exchange new theory and applications with colleagues from around the world. I am thankful to Eric Berne, his followers, and to all of us for keeping the power and goal of spontaneity, authenticity, intimacy, and personal responsibility alive. Felipe Garcia can be reached at fgarcia99@gmail.com . Berne, E. (1961). 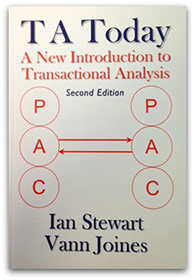 Transactional analysis in psychotherapy: A systematic individual and social psychiatry. New York: Ballantine Books. Berne, E. (1966). Group treatment. New York: Grove Press. Learn more about TA and ego states.